I am a soccer coach for a 11 and 12 year old boys team in Los Angeles, California. One of my players was a young boy whom I took a great liking to because of his demeanor. He was a good boy and learned very fast. I found out this boy was also doing well in School. The boys parents were from a town called Matatlan in Oaxaca, Mexico. After about 4 years of coaching the boy, I found that his parents spoke Zapotec. 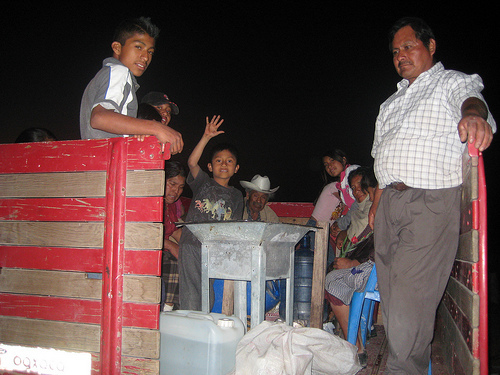 The boy understood the Zapotec language and he spoke Spanish and English as well. The boy was born in Los Angeles. After 3 years of coaching this boy, I noticed his father was not around anymore and his family did not tell me for months where he was. I started to give the boy a ride to and from practice since he had trouble making it the games and practices. I wondered where his father was. Finally the mother told me that the boy's father was detained by immigration. I continued to take the boy to and from practice and finally after one year, I became aware that the father was to be deported. The family would go back to Oaxaca. I spoke to the boy and he was not happy about going to Oaxaca since he had never been there. I just told him keeping the family together was the most important thing. Finally the day came and the boy and his family left for Oaxaca. The team gave the a farewell farewell party and I told him that I would visit him someday. Well I did keep my promise and I visited him and his family after 1 year. My wife and I were to make a trip to Mexico City to visit relatives and then take the bus to Oaxaca City, the capital of the State of Oaxaca and then I would telephone the family once I arrived. The bus ride was very nice in the ADO first class bus. They had movie screens and it was just like a plane ride. The bus ride from Mexico City to Oaxaca took about 6 hours. My wife and arrived in Oaxaca City and we got a hotel that was very nice near the Zocalo. It was called the Hotel de la Parra. 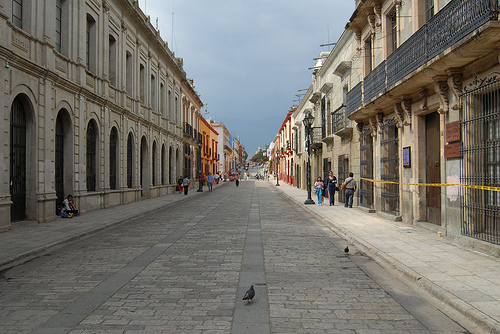 We went all over the Oaxaca City and ate at different restaurants. A lady street vendor offered us the local delicacy of Chapulines (grasshoppers). I tried them and they were not bad. Consider it like the French Escargot or snails. If you have never been to Monte Alban, you have to go. I have been to many Mexican States and there are two states that you must visit plus the capital. The states are Guanajuato and Oaxaca. The other place is Mexico City. These are must visits in Mexico. Well after visiting Monte Alban, I contracted with a taxi to take us to Matatlan which is a one hour taxi ride from Oaxaca City. Matatlan is in the Valley or low areas. Many towns are in the mountains which I did not get to visit this trip but maybe in the next trip I will be able to visit the mountain towns. Matatlan is actually a very well known town since it is known as the world capital of Mezcal. 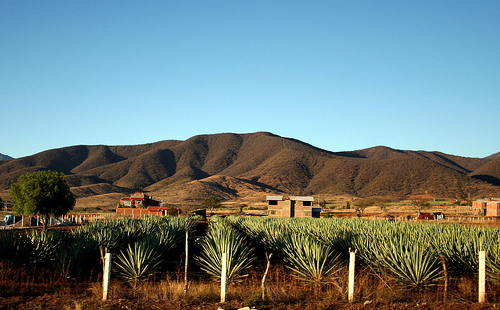 Mezcal is known in different areas of Mexico as Vino Mexicano, Tequila and other names. 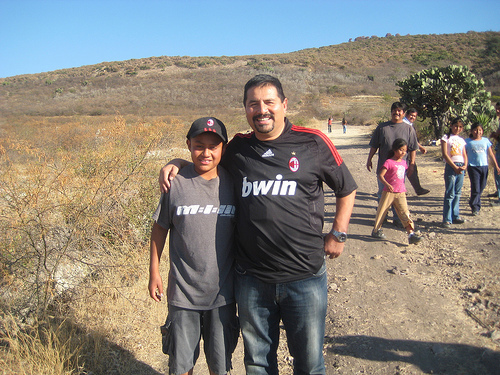 Well we met the family right outside the limits of Matatlan in a place called Cruz del Milagro (Miracle Cross). I was very excited to see the boy again. When you coach the kids, you get very attached to them. I think of them as my kids. The family wanted to have a picnic at this place. When we arrived, we were welcomed with the typical Mexican hugs. I had not see the father for some time and he has lost some weight. The boy also lost some weight. I guess it was because of the good Oaxaca native cooking. There are no fast good places in Matatlan. The welcoming came with toasts of Mezcal in very small plastic cups smaller than shot glasses. The barbeque was started and the molcajete was ready with fresh vegetables to make a delicious salsa. Pulque with pineapple chunks inside was given to me and it was delicious. The pulque was very fresh and not fermented at all which made it acceptable for children to drink. Jorge was in good spirits when I arrived. He was very healthy and happy in Oaxaca. He adjusted quickly to school and life in Mexico. He was happy to see me. The parents, uncles, aunts, and grandparents were all very nice people. 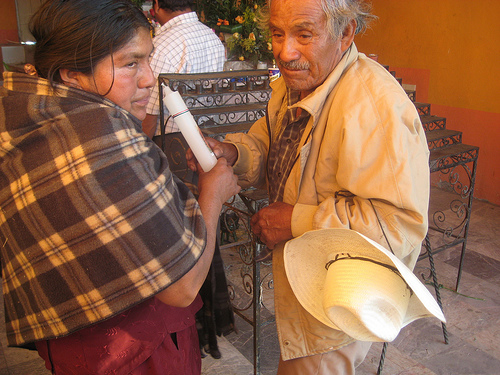 The grandparents only spoke Zapotec. I had never hear Zapotec before and after hearing it fell in love with it. Zapotec sounded so beautiful. The grandfather and I spoke through an interpreter which as the boys father. He and I became friends very fast. He spoke to me a few things that stuck in my mind such as respect for people who have different cultures. Respect is what breaks down barriers. Each culture is beautiful and has something to contribute to the world. He spoke to me a little about his life which I found very interesting. 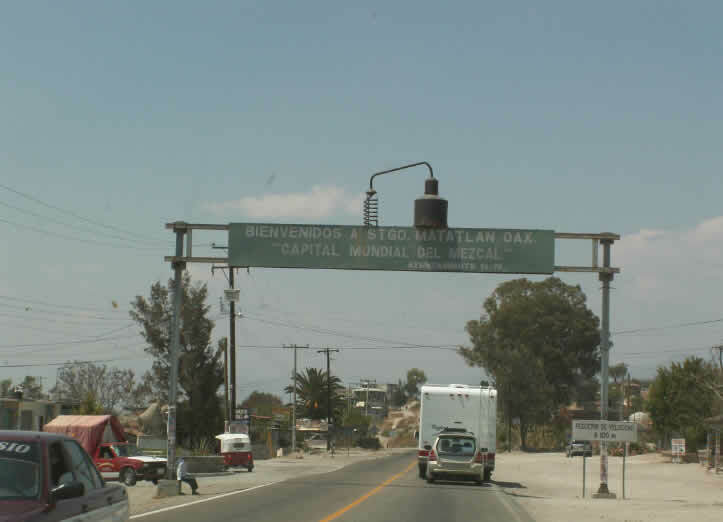 For example, he told me that Matatlan went through shortages of food frequently until a road was built through the town. 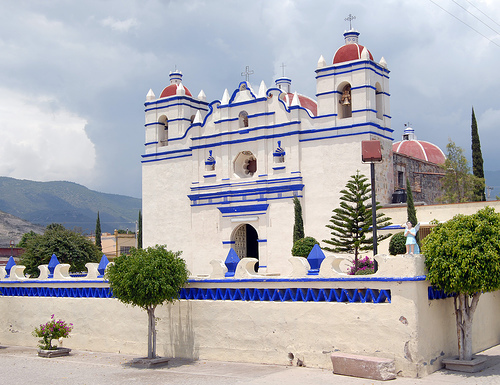 Matatlan is a Zapotec speaking town. 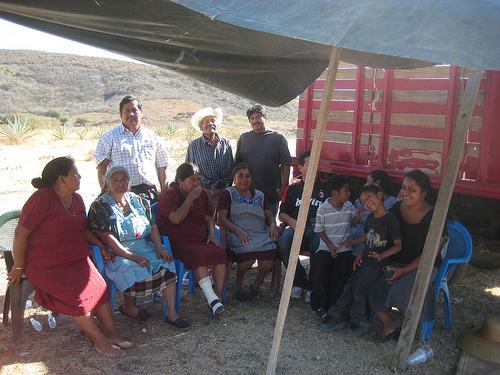 Everyone speaks Zapotec in the town and the people only speak spanish to people that do not know Zapotec. The reason for this is mostly like because of the fact that the town did not have any roads to it from the outside and travel to the town was not easy or quick. Once the highway was built the village was able to bring in food from the outside and it no longer suffered shortages of food. The grandfather worked on building the highway. He had worked on a farm but he told me the highway work paid much more. I found it interesting that the road was built with laborers that did not speak Spanish. Before we had a drink of mezcal or pulque the grandfather always dropped a little on the ground for mother earth, even a little food was dropped for mother earth. Interesting custom. Here is the grandmother and my wife. 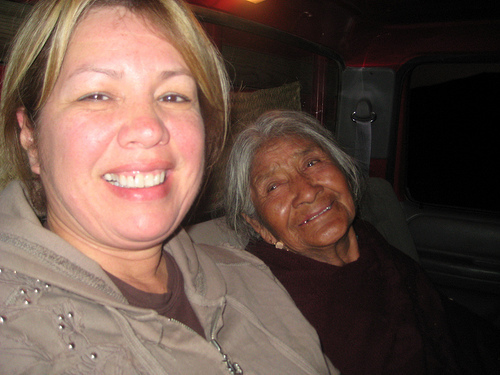 After the picnic, we all jumped into the back of the truck and went to the grandfather's house. The 5 gallon container you see does not have gas. It contains mezcal. Jorge is waving. The uncle is there near the door. He never left the town so his Spanish is not so good. He mainly speaks Zapotec.